Up Late Working... And Then This Happened! Whenever I'm up working late, I uncover ridiculous things, but then again, I work in social media and ridiculous tends to be the norm here. I will keep this short, but when you see what I stumbled upon while putting together a client presentation, I trust you'll be amused. I am writing a client presentation on social influencers, who they are, where we find them, what they do, and most importantly, what's their ROI. The social influencer presentation is due tomorrow and I've been having trouble finding good stats around Instagram engagement. I need to show the client that the influencer's followers (or supposed reach) is not as relevant as it appears, because those are easily purchased (for like $3), it's engagement that should be valued above all. You can't fake engagement (you can't fake comments but you can fake likes). 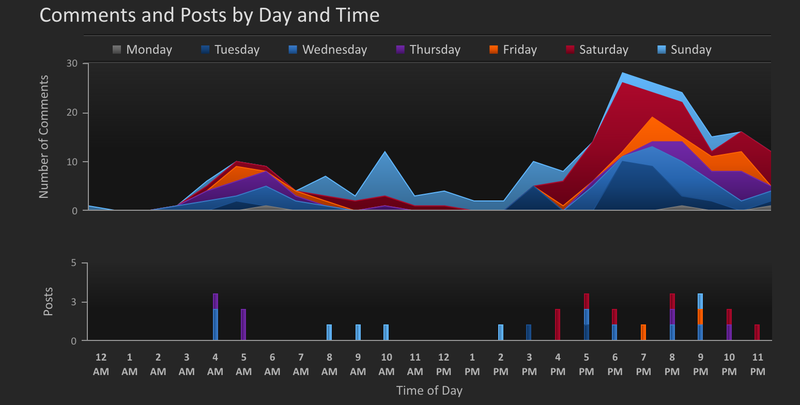 Finally, I logged onto SimplyMeasured and pulled my own Instagram stats (that fancy graph up there, that's me). I found a few number that back up my 1:10 ratio theory that for every comment there should be 10 likes. Screw the number of followers, so long as they're within reason. Next I head over to Twitter to pull some analytics benchmarks, and again, I log onto my own page. Not because I'm that important but because I can pull my stats very quickly... and it's late and I'm tired. I scroll past last month's snapshot report, the month previous to that, and then finally I get to February and there I find a popular post. I'm not sure what this post is yet, so I expand the stats and it's confusing but I finally figure it out. 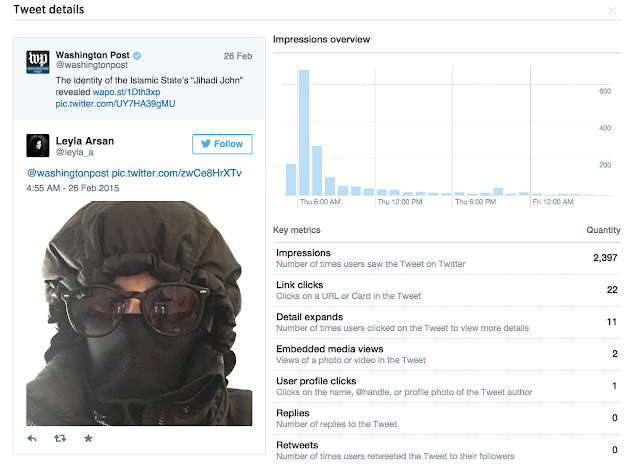 To give you an idea of what the page looks like, I've attached a visual from the top of the Twitter analytics page. As you scroll down, you get breakdowns by top content, most impressions, most engagements, etc. So, now that you an idea of what I was looking through to get my stat, keep reading. I kept scrolling and I saw a smaller tweet with just a portion of my face and it said, "Top Content" because in the month of February the Tweet with the photo received the most impressions of all my Tweets or posts. I dig deeper and expand the Tweet details... and much to my surprise, I find this. So the snapshot above is what the full expanded version of Tweet analytics look like. But when I looked at the photo, I still didn't get it? Did Washington Post Tweet me? What happened, why is this stupid photo of me up here? So I navigate to the actual post that still lives on WP's Twitter page. The first photo started to make sense, I could almost hear myself laughing. I more info, so I clicked through to extend the tweet in order to gain more clarity. And I immediately understand what's happening. Take a look at the timestamp - 4:53 AM. I decide to expand the full tweet to get the whole story. I have trouble sleeping, a lot. I can usually GO to bed but not STAY asleep. My prediction is that I woke up around 4:AM and started to scroll through Twitter, reading the news just like I always do in the morning. 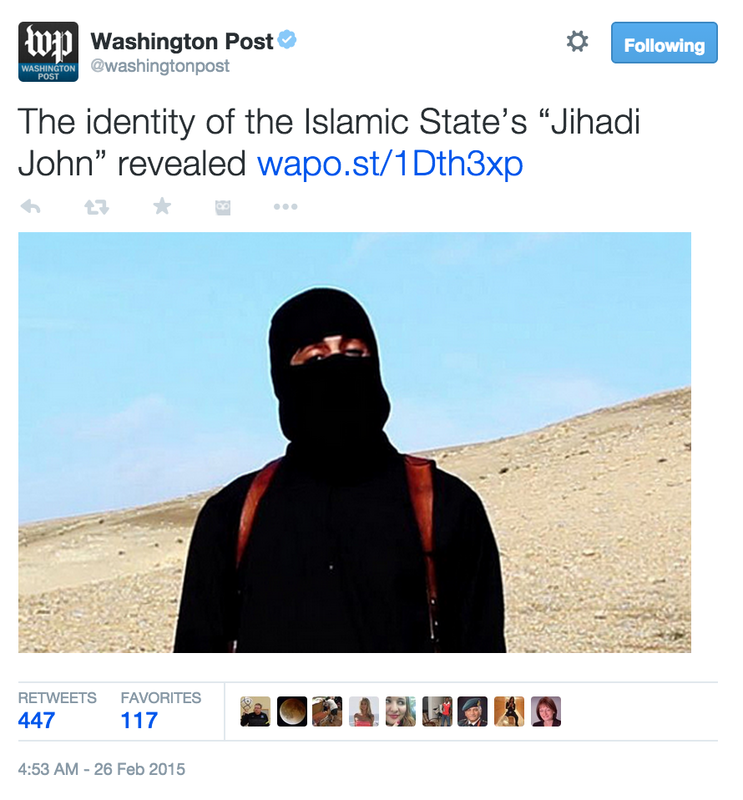 That's when the Washington Post article about Jihadi John went through my stream. This photo (apparently) resonated with me and I immediately reached for my phone and found this one out of the 2000 images I store on that thing. 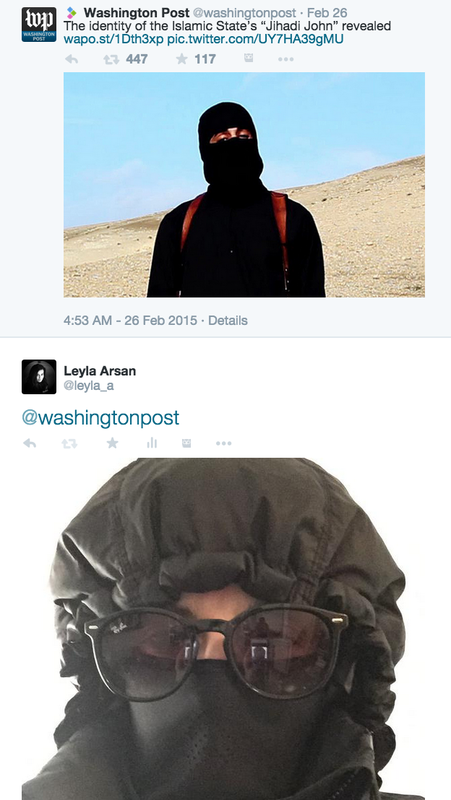 I then sent it to Washington Post with no context and somehow never thought about it again until now. Now, I don't know what you would do, but I'm TOTALLY putting this into my client presentation!